Maulaana Ashraf Ali Thanvi narrates from Maulvi Nidhaam ud-Deen Karaanwi, and he narrates from Maulvi Abdullah Haraaqi that a very trustworthy person Walaaiti said that: One of my Friends, who had given allegiance (Bayt) to Baqiyyat us-Salaf Hujjat ul-Khalaf Qaduwwat us-Saalikeen Zubdat ul-Arifeen Shaikh ul-Kul fil Kul Hadhrat Maulaana Haaji Imdaadullaah Saahib Chishti Saabri Thaanvi al-Makki rahimahullah, went to Khana Ka’bah for Hajj. He departed on a ship from Mumbai (India). The ship, on its way, got struck, and it was very close that it would drown in the sea, or it might demolish into pieces with another strike. When he saw that there is no other way except dying, he thought of his Peer and said what else would be the best time of Imdaad than this. Allaah Ta’aala is the absolute Hearer and Observer of all things. Immediately, their Ship got out of the water and all the people were saved. This incidence occurred here and on the other day “the Patron of the mankind” [Imdaadullaah] told his servant to massage his back as it hurts very terribly. As the servant lifted his shirt while massaging, he saw that his back is awfully wounded and the skin is peeled away from most of the places. I am sure Titanic regrets not having a silsilah on board. 1. Moulana Qasim Nanotwi (d. 1879): “The Darul-Uloom Deoband (the School of Deoband founded in 1868) was founded by Moulana Qasim Nanotwi.”He was ba’yt (taken the oath of allegiance) at the hands of Imdadullah Muhajir Makki. 2. Imdadullah Muhajir Makki (d. 1899): The highly revered Pir (spiritual guide) of the Deobandis. He is the spiritual guide of Moulana Ashraf Ali Thanvi, Moulana Qasim Nanotwi and Moulana Rasheed Ahmad Gangohi. 3. Moulana Ashraf Ali Thanvi (d. 1943): He was ba’yt at the hands of Haji Imdadullah Muhajir Makki and the author of many books like, “Bahishti Zewar” and ‘Tafseer Bayanul Qur’aan’. He named many of his books after his Pir, Imdadullah Muhajir Makki. 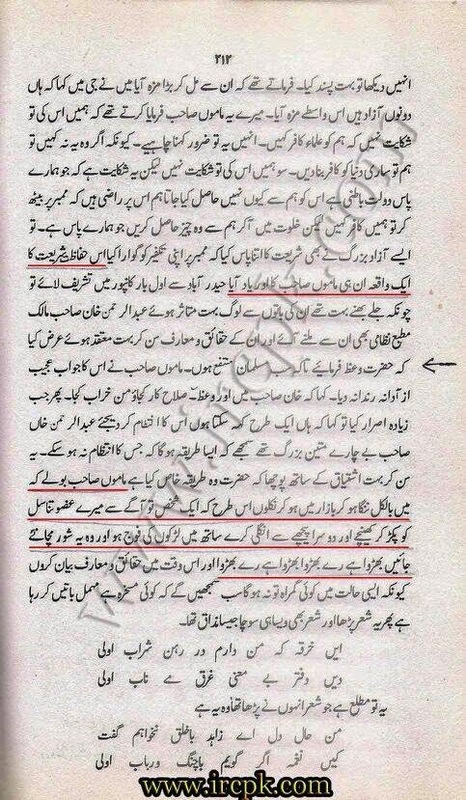 Like Imdadullah Muhajir Makki, Ashraf Ali Thanvi too was an advocate of Wahdat al-Wajood. Ashraf Ali Thanvi’s teachings greatly influenced the founder of the Jamaat Tableegh, Moulana Ilyas. 5. Other Prominent Deobandi Scholars include: Khalil Ahmad Saharanpuri, Aashiq Ilahi Meerathi, Moulana Mahmoodul-Hasan Deobandi, Moulana Shabbir Ahmad Uthmani and Moulana Abdul-Rahim Lajpuri. 6. Moulana Ilyas, popularly known as Hazratjee: (d. 1944): He was the founder and first Amir of the Jamaat Tableegh. He was the Khalifah (successor) of Khalil Ahmad Saharanpuri, who was amongst the Khulafa of Rasheed Ahmad Gungohi. He founded the Jamaat Tableegh on Sufi principles and incorporated many Sufi practices like Muraqabah (meditation), Chillah (40 day seclusion period) and the silent Dhikr (remembrance) into the routines of his Jamaat. 7. Moulana Muhammad Yusuf (d. 1965): Moulana Ilyas was succeeded by his son, Moulana Muhammad Yusuf (d. 1965), who became the second Amir of the Jamaat Tableegh. Inamul-Hasan succeeded Moulana Muhammad Yusuf. Presently, there is no Amir of the Jamaat Tableegh and its affairs are run by a Shoorah (committee). 8. Moulana Zakariyah: The son-in-law of Moulana Ilyas and the author of Fazaail-e-Aamaal. He was well acquainted with Sufism and was given the Khilafah of all the four Sufi Tareeqahs by Moulana Khalil Ahmad Saharanpuri.